Today the BLS, which isn’t part of the general US data blackout related to the government shutdown due to still-in-place appropriations, released the Job Openings and Labor Turnover Survey (JOLTS) data for the month of November. 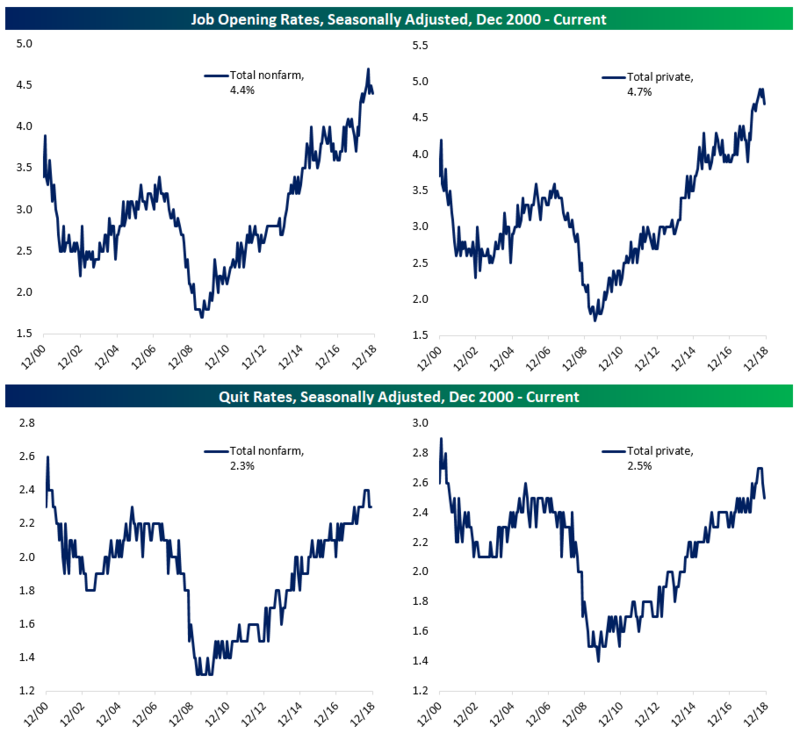 As shown in the charts below, openings rates (which measure the number of open positions at employers relative to the labor force and are an indication of labor demand) have come in a bit over the last few months after hitting record highs dating back to 2000 in the middle of last year. We should note that these rates are quite volatile and subject to significant revision, so a modest decline isn’t the end of the world. Quit rates, which are an indicator of labor confidence and bargaining power (measuring the number of quits relative to the labor force) have also pulled back a bit from the highest levels since the end of the 1990s expansion. One area where neither quits nor openings have shown any softness is for public school teachers. The openings rate is the joint-highest (with three other occurrences) since data collection began, and quits are also at the joint-highest levels of the entire series. 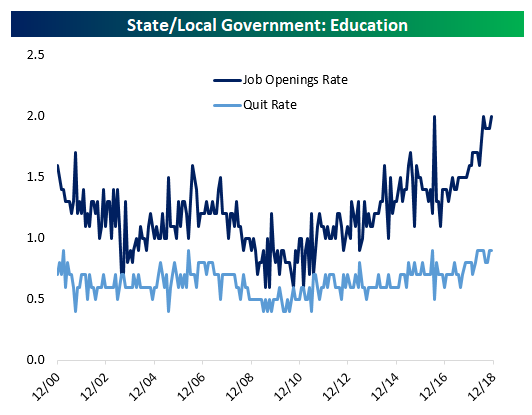 Pensions, stability, and tenure-related incentives are key reasons that job openings and quits for teachers are typically lower than the population as a whole, but this pocket of the labor market is facing much tighter conditions than has historically been the case. Low pay, benefit cuts, and other issues which have resulted in a number of national teachers’ strikes are all possible causes of the historically tight conditions in the educator labor market.